IBASSIN: 2017 Walmart FLW Mississippi River Day 2: Bryan Schmitt Leads with 46-12lbs! 2017 Walmart FLW Mississippi River Day 2: Bryan Schmitt Leads with 46-12lbs! Third leader in three days! 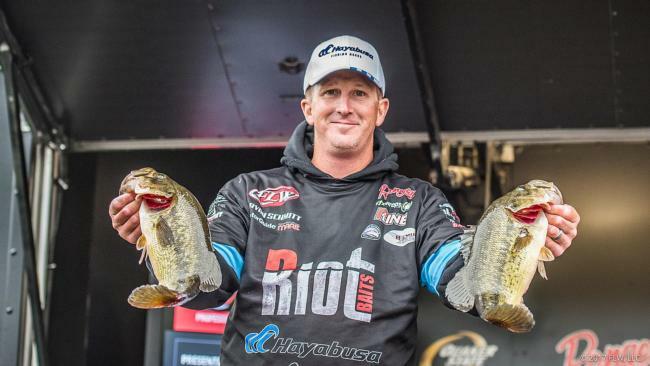 Pools 7, 8 and 9 on the Mississippi River have not disappointed this week during the FLW Tour presented by Evinrude on the Mississippi River, and following a day three that saw cold, steady rainfall, two of the best river wizards on Tour are locked in battle atop the leaderboard. Bryan Schmitt of Deale, Md., snatched the tournament lead away from Andy Morgan of Dayton, Tenn., on Friday by bringing in five bass weighing 15 pounds, 12 ounces, for a three-day total of 46-12. Schmitt will have a scant 12-ounce lead over Morgan going into the final day. In what has been an impressive trading of river wits on the Mighty Mississippi, Schmitt and Morgan have both served up some of their best river-reading skills this week. What makes this duo’s duel so interesting is that Schmitt is using river knowledge garnered from the Potomac River, while Morgan is battling with some good old-fashioned Tennessee River skills. The Potomac is Schmitt’s home waters, and he’s found a slice of the Potomac in a large grass bed in Pool 8. Within his primary area is a large, shallow bedding flat where river bass flocked to during the warm up before the tournament started. However, it’s not the bedding flat that has caught Schmitt’s eye. Instead, it’s a large depression just below the honeymoon suite where he believes prespawn bass are staging up for the next warm-up. Schmitt is seining the grass with one of his Potomac confidence lures: a swim jig. While he’s made his 15-pound-per-day average look easy, Schmitt says there is one thing that seriously threatens his first FLW Tour win: rising water. Right now, Schmitt is simply treating the rising water like an abnormally high tide on the Potomac, hoping that fish are conditioned to the heavier flows, higher ceiling and darker waters.